Exploring some of Europe's most iconic ancient and medieval stories, from the Homeric epics to the Icelandic sagas, and discovering how they resonate today. These are the stories that made a continent, and by exploring them we can discover what makes Europe tick. Encounters with Sicilian puppeteers, Balkan war veterans and Icelandic folk-singers. Adventures in underwater Mediterranean caves, icy fjords and rain-sodden barrows. 'Epic Continent' tells the tale of my adventures across a troubled continent. Featured in the NEW YORK TIMES BEST TRAVEL BOOKS OF THE YEAR - read HERE. READ MY INTERVIEW WITH NATIONAL GEOGRAPHIC HERE, WATCH THE BOOK TRAILER HERE OR READ AN ARTICLE ABOUT TRAVELLING IN THE SAHARA HERE. "The Timbuktu School for Nomads is an abundantly energetic gold-mine of a book. Heaped with history and background information, with ideas, adventures and poignant postulations, it stares right in the face of current events." 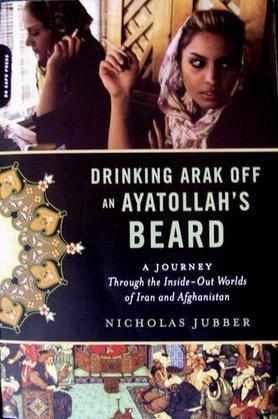 Drinking Arak off An Ayatollah's Beard: A journey through the Inside-Out Worlds of Iran and Afghanistan. "From the twinkling navels of Iran's illicit raves to the war-weary towns of southern Afghanistan... a compendium of humour, insight and scholarly detail, and an authentic love affair with Persian culture that outstrips time itself." Jason Elliot, author of An Unexpected Light and Mirrors of the Unseen. Winner of the Dolman Travel Book Award. "Jubber's debut is a gloriously entertaining historical romp. His quest for Prester John is one of suspense and high adventure - a heady blend of epic riddle and historical jigsaw that is written with exuberance, confidence and passion." Giles Milton, author of Nathaniel's Nutmeg and White Gold.